Sibling rivalry is a tale as old as time itself. Just remember one of the oldest stories from the Bible – Cain was jealous that God would accept Abel’s sacrifice, but not his! Nowadays, luckily, sibling conflicts are resolved in a much calmer way, but they can still cause problems, for both siblings and their parents. The first lesson is: even if you had perfect children, you wouldn’t get out of it without some tension and rivalry – and here’s why. Perhaps the biggest reason siblings see each other as rivals is because they are in a constant fight for your attention. And since people aren’t exact machines, we aren’t able to dedicate exactly the same amount of attention to each child, much as we might want to. No matter how similar the children may be – even if they’re twins! – there will always be differences between them that require us to treat them if only a bit differently. We’re often unaware of this, but children tend to notice it. Gender and age differences alone more often than not cause parents to treat their children in very different ways. Dads might be more gentle with their daughters than their sons, but sons may be granted more freedom and a later curfew. The tricky thing is, no daughter will focus on the extra attention, nor son on the extra permission: they’ll tend to focus on the negatives and see themselves as less loved and less worthy. Also, the closer the siblings are in age, the more reason they’ll have to fight. They’ll want to play with same toys, have the same relationship with you, play the same video games… But on the other hand, if there’s a wider age difference, the older one may get angry if the younger one makes them feel embarrassed in front of their friends. It seems like there’s no escape! So far, it seems like whatever you do, fights are inevitable! That is true to some extent, and we’ll talk later on about the positive sides of sibling rivalry. However, certain things are in your control and can be prevented. 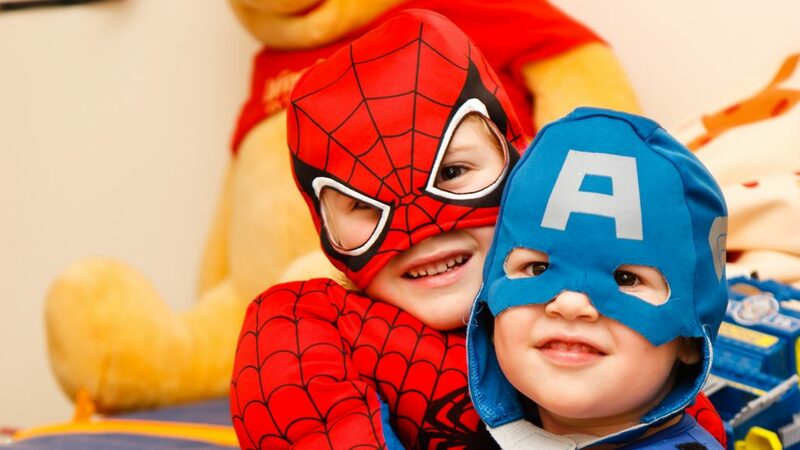 Even Spiderman and Captain America found a way to overcome their issues. New parents, given their inexperience and natural anxiety, often overprotect their first child. When the second one comes along, you feel more confident and trust yourself more, so you’ll probably end up granting that child more latitude. But as understandable as this is, think of how it’s affecting the older child. They’ll probably end up thinking, “They don’t love me and care as much” or “They don’t really trust me”. What you can do is adapt your responses to meet the situation. Now that your younger one has a curfew until 10, give the older one a slightly longer one – 11 or 12. Treating them the same even though they’re four years apart is not exactly equal, so as hard as it is to see them grow up – let them know they’ve earned your confidence. If their fight is about something else – whose toy it is, whose turn it is to walk the dog, etc. – give them time to come up with a solution among themselves. However, if you notice that’s not going anywhere, offer mediation, but without taking sides. Try to look at it objectively. Ask them to give you the arguments for why they each think the other one should be walking the dog. You can even have them write their arguments down. Let them present their reasons one by one, and once you have all the facts, ask them if it’s now clear to them who should be doing the task. If they’re still unwilling to find a solution, you can offer one, but not without providing them with an explanation why. Does your family have the smart one? The athletic one? The artistic one? If it does, try not to call them that. Of course you’re allowed to think of them that way, but the minute you say, “Oh, my Josh is the smart one”, the other child will, without a doubt, be thinking, “That must mean I’m the dumb one”. You should be nurturing their strengths – by all means! – but in such a way that they don’t feel that being a “geek” or a “football player” is all they can ever be. We talked about the self-fulfilling prophecy before – the way you talk about your children could become who they are. Using a language free of labels works wonders in giving them more options. …which doesn’t have to be a negative thing. If you, say, have a gifted child, treating both of them the same could lead to the gifted one not reaching their full potential. In the end, they might be resentful of both you and their sibling – “If only Mary weren’t so dumb, I could have been at MIT right now!” Instead, nurture their strengths. If you see they’re gifted, enroll them in different programs that could help them develop even further. As for their sibling, inspire them to try out different things as well, and make sure to be open about everything. Explain that just because John is a straight A student and making apps at 17, doesn’t mean that you love Mary any less. They’re both equally valuable, and the important thing is to have each follow their passion and do whatever makes them happy. In short, give the gifted child what they need, but don’t concentrate all of your love and pride on them only. Can Sibling Rivalry be Beneficial? Absolutely! Children’s first conflicts happen between them and their siblings. In the warm, nurturing, safe atmosphere of their own home, they’ll have plenty of chances to figure out what works and what doesn’t when it comes to disagreements with others. If handled well, they’ll learn the values of negotiation and teamwork. Another important thing conflict will teach them is resilience. If you’re always stepping in to protect the younger one and keep them from any hardships, they’ll be left without the skills necessary to stand up for themselves. They’ll always be expecting others to swoop in and save them. It’s much better if they get to practice this with their brother/sister first, even if it ends in tears from time to time, than for them to be left helpless later on. Just remember that treating two very different individuals differently is completely normal and you shouldn’t beat yourself up over it. Do your best to be just and to catch yourself in showing signs of favoritism, and there’ll be no reason to worry about sibling rivalry too much. https://nobelcoaching.com/wp-content/uploads/2019/04/Kaver.jpg 1537 2305 Jelena J. https://nobelcoaching.com/wp-content/uploads/2017/12/nobel-coaching-and-tutoring-logo.png Jelena J.2019-04-12 01:40:162019-04-12 02:40:02Sibling Rivalry: How Can Parents Deal with It? We’ve all felt guilty about one thing or another sometime in our lives. But perhaps the most haunting type of guilt is mother’s guilt. There aren’t many mothers who’ve never felt guilty about their parenting, even if it’s for just a second. But when does it become an issue? Let’s start by defining the term “mother’s guilt”. It’s the guilt that arises in mothers who feel they aren’t “good enough” parents. There are various reasons they might be thinking this: punishing a child often, not letting them do what the other kids are doing (this can often happen with teenagers), and perhaps the most common one today (that we will be focusing on) – not spending enough time with them. Have you ever ordered a pizza instead of making them the dinner you promised, because you got held up at work? Or have you left them to deal with their homework themselves so you can answer a couple of emails, and lost track of time? If yes, it might have made you feel guilty. And while not being sure about what you’re doing from time to time is perfectly normal, being caught up in guilt constantly, up to the point it messes with your everyday tasks – that’s a sign of an issue that you should talk about with someone. There’s a fault in most human brains: we tend to focus on the bad and completely ignore the good. I challenge you to take a pen and paper right now and write down at least three things you think you’re doing well as a mom! It can be something as small as giving everyone a goodbye kiss when you leave for work in the morning, or the fact that you treated your kids to ice cream that one time last week. Don’t be too hard on yourself, and don’t flag everything that’s good as unimportant. You might worry that your kids will hold your flaws against you, but they’re just as likely to cherish the memories you make with them. How often have you seen someone’s bad photo on Instagram? Or a bad photo of their kids with the caption “I’m a terrible mom”? Everyone wants to look good on social media, so everyone chooses the best parts of their lives to display to others. Comparing your reality to their highlights makes no sense! Every mom has problems, even if they aren’t up to showing it online. So the next time you see a mom who looks like they have it all figured out, take a closer look at your friends and cousins. Take a look at your own parents, too! Do any of them have it all under control 100% of the time, feeling perfectly proud of themselves? And if you need to unfollow those moms or delete your Instagram account to make yourself feel better, go for it. Your mental health and self-esteem should be much more important than being able to look at pretty photos 24/7. Venting to friends may be a great way to feel better, but while it helps temporarily, it doesn’t necessarily change what you’re feeling guilty about. But asking for help does. If you’re worried that you’re not helping your child enough with their studies, and you’re afraid they might be falling behind, there’s no shame in letting an online tutor help you out. Tutoring sessions all happen online, so it won’t be extra hard on you, nor on your child. Nobel tutors will help your child master the subject that’s troubling them, and they won’t even have to leave their room! That means no driving around for you, and no extra tasks on your to-do list. You don’t have to do everything alone. In today’s busy world, you have the choice to either let others help, or to take everything upon yourself until you go crazy from all the stress. You can also opt for Academic Coaching where Nobel’s coaches focus on the child’s motivation, anxiety, and any other psychological barriers that might be impeding academic success. The most common source of all misunderstandings are assumptions. (link to our article about communication). You might think that your kids are holding your lack of time for them against you, when they might really be proud of you for working so hard. But you’ll never know for sure until you ask them! Ask about their feelings and whether they have some ideas about how you can spend more time together. Make a plan and, just as important, share your feelings, too! They need to have you as an example that sharing feelings is a wonderful thing that can only lead to more good things. Now, if they tell you they’re mad at you, sad, or disappointed, don’t despair. All feelings are normal, negative ones included. Try to talk to them more about it and see how you can change something. And if you think their negative feelings are something they might have trouble dealing with, our coaches can help – not only them, but you, too. Try to bear in mind that this conversation will bring many emotional benefits to them as well. If they see their parents asking for help, your kids will be more likely to take care of themselves and ask for help for themselves, which will ultimately make them happier and healthier. Overcoming mother’s guilt is not an easy thing to do, but the first step is always the hardest. The important thing is to let yourself know you have the right to live your own life, and that it doesn’t mean you love your kids any less than you should. You taking good care of yourself while finding alternative ways to help your kids is the best possible solution for the struggles of this modern age. Being mindful has many benefits, but it sounds complicated and demanding. Also, some people think that practicing mindfulness requires meditation or yoga, for example. But mindfulness doesn’t have to include much time or yoga mats. What if we say there are plenty of easy ways to practice mindfulness in your everyday life? And by doing so, you can de-stress and do your best. So, no more excuses – let’s start! Our bodies dehydrate overnight, so start the day with a glass of water at breakfast. Pay attention to how that gulp is going through your body. Also, try not to think about anything else. To stay energetic, don’t forget to drink lots of water all day. It doesn’t sound hard, does it? 2. Make your bed in the morning. While making a fresh cup of coffee to start your day, make sure to make your bed. Slow down your breathing as you smooth your sheets and tuck in corners. This way, making bed is not a chore, but a mindful practice. Further, you will feel as if you have already completed a task and started your day productively. Starting the day with a habit will help you develop other useful habits. It has also been shown that, since you spend a large portion of your life in your bedroom, the way it looks can severely affect your mood, so making the bed equals better mood and less stress throughout the day! Avoid multitasking while eating your lunch – take at least 15 minutes to focus completely on enjoying your meal, allowing it to re-energize you. Also, chew your food slowly. While eating, enjoy the texture and the taste. This is shown to boost your mood and register more satisfaction, which further curbs overeating. It doesn’t matter whether you’re at work or home, being in chaos can cause stress and anxiety. Picking things and organizing them is a pretty simple way to reduce that stress. Also, while doing so pay attention to every bit and piece of objects and to each placement of the object. To practice mindfulness while organizing, you are called to turn your attention to what’s happening right now: what you are thinking, what you are feeling, and what your senses are telling you. 5. Stretch whenever you can. Nowadays, we spend most of our time at the desk, working, studying or just surfing the internet. To say that that amount of sitting is bad for our health would be an understatement. Be aware of your body and take a rest from sitting. Get up for at least a few minutes every hour and walk around your room or office, or use that time to stretch. You will see that it not only helps your body but your mind as well! 6. Turn off your devices. Mobile phone ringing and beeping every now and then can cause anxiety. Also, we usually constantly check emails and social networks on our devices. It distracts us from our primary activities and people around us. Therefore, every once in a while turn off your devices. This way you’ll be more productive and refresh yourself. 7. Pay attention to your breathing. You don’t have to sit and cross your legs to practice mindfulness. As you walk to the store or to work practice mindfulness. Focus on your breathing and each step you take. This way you’ll clear your mind of clutter, decrease stress, restore your sense of focus, and increases overall well-being. Your to-do list is pretty long, right? Also, there are many things that you haven’t included there. But it is good to pause between your actions. Take a moment and be proud that you’ve done something. Let yourself to rest a bit. And don’t think about other stuff that is waiting to be done. 10. Do your routine activities mindfully. Everything you do can be a way of practicing mindfulness, especially those activities that are not demanding. Try to pay more attention as you’re brushing your teeth before bed, for example. Try to be more aware – activate all of your senses. Maybe you’ll find those activities more interesting than you thought. Mindfulness can easily be integrated into your daily routine. As we can conclude from above, there are so many tasks that we take for granted, but they are all primed for more mindfulness. However, nothing can be done in one day. Try practicing these tips for a few days and they will become even easier. Try practicing them for a few weeks and they will become habits! Heaversedge, J., & Halliwell, E. (2012). The mindful manifesto: How doing less and noticing more can help us thrive in a stressed-out world. Hay House, Inc.
Executive function is a set of mental processes that helps us manage, plan, and organize our activities in order to achieve a certain goal . Extensive neuropsychological research places it in the prefrontal cortex and even though it forms in early childhood, it continues to develop and change throughout our lifetime. It plays an essential part in our everyday dealings and we rely on it when faced with situations that require us to make decisions and see them through. If we were to compare our brains to a complex organization, executive function would be the equivalent of a CEO. Essentially, executive function is what allows us to get things done, and it’s important to understand how it works so that we can really appreciate its value and potentially work on improving it. Executive function is a complex construct consisting of three key components or areas, which are: working memory, cognitive flexibility, and impulse control. All of these components are interconnected and together allow us to do things like process information, switch from task to task, and hold back impulsive behavior. Working memory represents the more advanced understanding of our short-term memory, the one we use to store information happening in the present and hold onto it for a brief period of time in order to deal with a task at hand. So, for example, if you’re having a conversation with someone, working memory is allowing you to follow what they’re saying and respond or engage them by asking relevant questions. Cognitive flexibility refers to our ability to adapt our mental strategies to new conditions. When faced with a task we’ve never encountered in the past, cognitive flexibility allows us to rapidly use our past experience, knowledge, and skills to overcome that particular challenge. Impulse control is referred to as self-control in layman’s terms. It is our capability to subdue impulsive behavior and refrain from acting abruptly to a specific stimulus. For instance, if you’re feeling frustrated, impulse control is what holds you back from lashing out at others, keeps you calm, and allows you to rationally assess the situation. Paying attention – being able to focus and process information for an extended period of time. Planning and organizing – setting up the proper conditions and taking the right steps in the process of decision-making and overcoming challenges. Time assessment and time management – being able to predict the time it would take to complete a certain task and adjusting your activities in order to complete the most tasks in the shortest amount of time. Initiating and completing tasks – actually getting started with an activity that will help you complete a task and see it through. Prioritizing – being able to assess the importance of tasks and to rank them accordingly. The combined effort of the key areas is needed in order to complete these tasks, but not all of them are always being activated. For instance, paying attention depends on the use of working memory and impulse control, while planning and organizing require all three. Being able to perform these activities successfully is referred to as having executive-functioning skills. Executive function can be trained and improved over time, which means that understanding how it works can be a huge benefit in terms of both academic and real-life success. When studying human behavior, it’s always a good rule of thumb to have the question of context in mind. Some phenomena may be more or less consistent but they are usually connected to a network of factors and can have different interpretations depending on the situation. Such is the case with executive function, which is contextually related to and affected by an emotional factor. That is why we differentiate between hot and cool executive functions . Hot executive functions are used when emotions are running high. In order for them to be activated, a certain amount of tension between instant and long-term gratification needs to exist. On the other hand, cool executive functions are activated when there is no emotional arousal whatsoever. The most important thing that determines whether we’re going to use hot or cool executive functions is the way in which we perceive the challenge in front of us. It’s a matter of individual differences, meaning there are specific situations out there that would invoke the use of hot executive functions in some, while others will be able to remain cool. Poor planning and organization – working in messy conditions without having the “bigger picture” in mind. Impulsive behavior – lacking impulse control and overreacting. Struggling with time management – always being late for scheduled appointments and missing deadlines. Lack of and/or inability to focus – attention tends to drift in the middle of an important activity. Working-memory difficulties – having difficulty retaining information for short periods of time. Procrastination – avoiding or struggling to initiate task resolution. Prioritization issues – not being able to determine the importance of certain tasks. Rigid thinking patterns – showing frustration when asked to think about a certain issue in a different way. Real-life examples of executive-functioning skills and issues! Direct advice on how to improve executive functioning! Access to a whole community of parents just like you! And tons more information about executive function! Take a look at this introductory video with our Coach Ana, which briefly sums up what the course is all about. Executive Function and Psychological Disorders: Is Executive-Function Disorder a Thing? In psychology, a sizable amount of data regarding specific mental processes and brain functions comes from examining the unfortunate cases of people exhibiting certain issues or complete lack thereof. Disorders in the domain of executive functioning are directly related to and reflect on the areas and skills we’ve discussed in the previous segment. That being said, executive function disorder as such is not yet recognized by the American Psychiatric Association officially. However, studies imply that executive-functioning challenges are closely connected to other cognitive disorders, such as ADHD and dyslexia. People suffering from ADHD are in fact struggling with scattered attention, impulsive behavior, and hyperactivity which leads to different social difficulties. 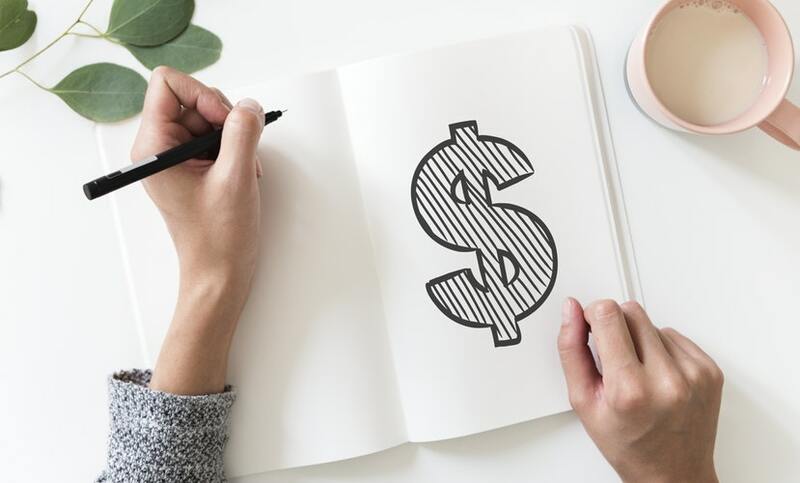 You’re probably already able to sense the connection between these symptoms and what we previously defined as an executive-function deficit . The fact of the matter is these two issues share the same neurophysiological background. Even though executive function can’t explain the cause of ADHD, it’s obvious that it is a component of how the disorder actually plays out. That is why children with ADHD can benefit from executive-function exercises and why consulting an executive function Coach is highly recommended. Dyslexia is a neurobiological learning disability characterized by difficulties with word recognition, spelling, and decoding abilities . Studies show that children with dyslexia also experience challenges in areas related to executive function, like verbal and visual short-term processing and attention. By strategically improving these domains of executive function, children with dyslexia can learn how to compensate for and overcome the limiting nature of their disability. Once again, consulting an executive-function Coach can help you devise a plan to systematically work on tackling this issue. It’s very important for us to understand that executive-functioning issues are not only found in a school setting, but also interfere with everyday activities such as doing chores, having productive conversations, and even affect the simple act of playing. On that note, we will describe two scenarios – academic and real life – connected to executive-functioning issues. Mary is four and she has recently started preschool. A couple of days ago, she threw a tantrum when another child from the class didn’t want to share a stuffed toy elephant. At the end of each day, she’s almost always the last one ready, usually because she left her things all over the classroom and then forgot where they were. Her teacher noticed that often during group activities and interaction, she responds by saying things completely unrelated to the topic or task. Josh is 16, and his parents feel that something is just not right. He often wanders from room to room, starts doing one thing and quickly switches to another. His chores are a similar story. He often procrastinates and puts things off, like cleaning the garage or folding his laundry, and even when he does manage to start doing them, he either quits soon after or doesn’t do a very good job. He’s recently asked for his allowance to be increased but left the discussion abruptly, showing signs of frustration when asked to back up his request with arguments. Remember that taking a holistic approach is very important when determining whether or not someone has issues with executive function. Both of these examples contain descriptions of behaviors representative of executive-functioning issues, but they are exclusively exploring situations related to a specific setting. Only by looking at the whole picture are we able to claim that someone is actually suffering from an executive-function deficit and that other factors are not at play, such as lack of motivation. If you think your child is struggling in similar ways, our Coaches are highly experienced with resolving specific executive-functioning issues and helping children overcome the deficits that accompany them. Why Is Understanding Executive Function so Important? Executive function refers to a set of mental processes that help us handle most of our everyday activities. Many aspects of concepts like creativity, problem-solving, and good decision-making rely on these processes. The good news is that we can help our kids develop and improve their executive function. The really good news is that we can use their personal strengths to compensate for those skills they find hard to improve. We’re not talking about complex programs that are costly and time-consuming, but about everyday activities that facilitate growth and learning. It is evident that children would benefit from a structured and systematic practice of executive-functioning skills. That is exactly why it’s important for every parent to be familiar with the concept, so that they can help their children directly by encouraging activities which nurture executive function. Furthermore, in the bigger picture of educating children in general, it’s crucial that teachers are also well acquainted with executive function, so they can adapt their curriculum to encourage its development. Zelazo, P. D., & Cunningham, W. (2005). What is executive function? AboutkidsHealth. Hospital for Sick Children, Toronto. (Part one of a multi-part series). Recuperado el, 2. Goldstein, S., & Naglieri, J. A. (Eds.). (2013). Handbook of executive functioning. Springer Science & Business Media. Meltzer, L. (Ed.). (2018). Executive function in education: From theory to practice. Guilford Publications. Do you think your child could benefit from improving executive function? Is there anything you would like to know about more? Please leave your ideas and suggestions in the comments below. We’re eager to hear your thoughts on the subject! https://nobelcoaching.com/wp-content/uploads/2019/01/johannes-plenio-282234-unsplash.jpg 1948 3463 Jelena J. https://nobelcoaching.com/wp-content/uploads/2017/12/nobel-coaching-and-tutoring-logo.png Jelena J.2019-01-22 03:28:012019-04-10 09:20:54What Is Executive Function? Ah, January… The month of getting back to reality. The holidays are over and everyone’s back to their regular routine of working and going to school. 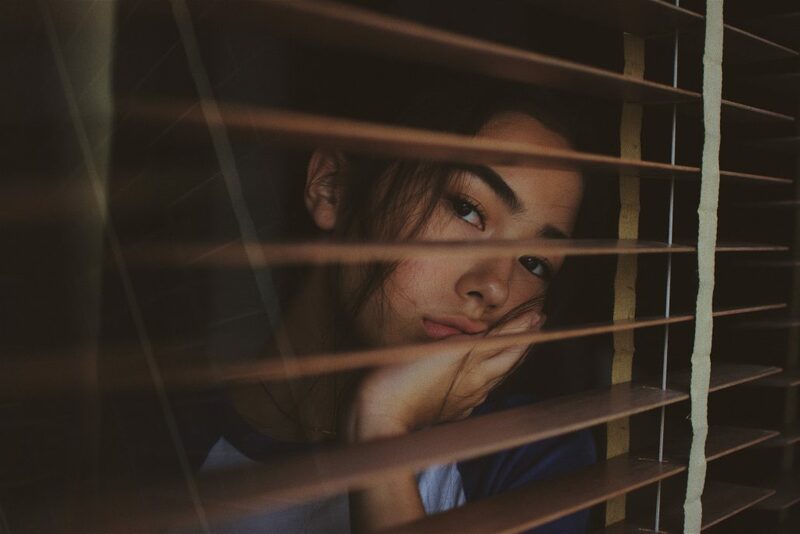 But now that the kids are used to sleeping in and getting some well deserved rest, procrastination may be an issue when it comes to getting up early for school and studying. So how can you help them find their motivation and get back to hustling? We have some ideas for you! Procrastination: Laziness or Something Else? The first question we should answer is: what is procrastination? For children who tend to procrastinate, it’s an ongoing habit that doesn’t depend on the time of year, a.k.a. chronic procrastination. However, it can become more apparent and troubling if they’ve just returned from vacation and are suddenly expected to be doing a million school assignments at once. Why is that? Are they just lazy? Well, if you came across this article when you were searching for topics like “how to overcome laziness”, we have some (good) news: procrastination usually doesn’t stem from children being lazy. Although the definition of procrastination is “avoidance of doing a task that needs to be accomplished” , that avoidance is usually the result of fear of failure. You can’t fail at something you never attempt in the first place, right? And the chance of failing is much greater if you’ve been on break for days or even weeks and are now suddenly required to be finishing task after task. Another cause of procrastination may be perfectionism. People who want to do things perfectly never feel quite ready to start doing them – they feel they could always be a bit more prepared. Combine that with not studying for a while and voilà – you’ve got yourself a perfectionist who’s afraid of failure and thus – procrastinating. This whole thing may sound scary, but there’s good news, too. It’s all about reversing bad habits. Although fear of failure and perfectionism are not habits per se – they’re emotional struggles – they’re difficult for children to overcome because they’re being reinforced. Every time the child feels stressed out, they choose to close up their books and whisper those magic words, “I’ll do it later – I have enough time”. This brings instant relief, which makes it easier for them to do the same thing over and over, just to calm their fear and anxiety. Though it might work for a while, time soon starts running out. So what can they do instead – and how can you help them? They can choose to stay in that stressful situation, or challenge themselves, and become stronger. It’s like exercise, really – you try to do one push-up for the first time, and it’s so difficult! You keep going, and eventually you can do two, three, five, until the moment you find everything less than twenty to be a piece of cake. But children shouldn’t be forced into it – instead, they need to develop certain skills and understanding of their issues before being able to confidently work on them. What you as a parent can do here is learn what makes your child fall behind at times and work on that with them. If you want to know more about how to help your child deal with different issues and help them become more independent, check out our upcoming Online Classes for Parents. What Are Some Other Reasons for Falling Behind? So, what happened? Your child did their best to keep up before the holidays, but now that they’ve gotten some rest, it’s become harder for them to get back into the study-hard mode. What can you do to help them become better at handling school assignments? How can you aid their productivity? One of the ways you can help them is by providing them with motivation. A more comprehensive list of ways to do that can be found in one of our previous articles, but it all comes down to intrinsic and extrinsic motivation. Intrinsic motivation is the one that lies inward. When the child is self-motivated, results tend to be better and the child is happier to tackle the necessary work. Extrinsic motivation, on the other hand, means you’re providing rewards for them – the motivation lies outside of them. This isn’t a bad thing – in fact, it’s a good way to start developing intrinsic motivation – but intrinsic motivation should be the main goal. For example, you can start motivating them by offering to make their favorite meal if they study for two hours every day that week. Make sure to praise the effort they’re putting into studying, rather than the result. For one thing, the effort will usually lead to good results; and it will all happen without the stress they’re feeling if they need to strive for the result. The “you must get an A” might cause test anxiety and further exacerbate their perfectionistic issues, which will have precisely the opposite effect from the desired one. Once they start seeing their efforts rewarded, they’re in a much better position to begin developing intrinsic motivation. In fact, one of the best ways to ease your child’s transition to school during the post-holiday period is to make studying creative and fun – and making their favorite meal together once they’ve studied enough is a good start . One more thing to pay attention to is the amount of time they spend using technology. They may have had a lot of time to browse through social media or YouTube while on vacation, but that amount should be lower now that they’re back at school . If any of this sounds familiar to you, schedule a free consultation with one of our Coaches and talk to them – together with your child – about their struggles and steps for overcoming them. Procrastination is a normal occurrence after the holidays. Just remember how difficult it is for you during those first few working days in January. Now, imagine if you had to go home and do homework and study on top of that! A lot of children tend to also be fearful of any sort of failure, or even be perfectionists when it comes to school. All of that can lead to avoiding school tasks, which can often be mistaken for laziness. The best thing you can do is to motivate them by rewarding their efforts. This will teach them both that effort really matters, and that they don’t need to be perfect, as long as they keep trying. Eventually, they may develop their own inner motivation for studying – and you’ll be happy to see that it’s bringing in good results, without your needing to reward them for it anymore. Holidays are usually associated with family get-togethers, excitement, and joy, especially nowadays, when modern society insists on perpetual cheerfulness. At the end of the year, we tend to look back on and evaluate the months behind us. But memory can be biased and we tend to predominantly remember the things we’ve done wrong. In order to defend ourselves from our own judgmental mind, we decide to make new decisions. Turn the page. Go big next year. We decide to quit smoking. Become a better parent. Find a job. Get a raise. Exercise. Suddenly there’s a rush of positive emotions. We’re excited, motivated, and determined. Then comes the Christmas and New Year celebrations when we eat too much, drink too much, over-socialize, spend lots of money, lose a lot of energy, and gain a few pounds. Then January ends, and we haven’t done anything. It might even seem like we’ve fallen behind. We become irritated by the simplest tasks, sad, tired, and lonely. We might feel like a failure as we struggle on, trying to hide how exhausted and close to tears we are inside. Since the human brain is designed to work based on associations, we might even begin to feel lonely, indifferent, and guilty with the first Christmas decorations. In order to save ourselves from disappointment, we quit even before we get started. Our Christmas gift to ourselves becomes melancholy, sadness, and a major case of the blues. With this, the holidays become fertile territory for conflicts, break-ups, and big changes in our life circumstances. And it all arises from our own feelings of pressure, responsibility, and the high expectations we impose on ourselves. How (non)realistic are our expectations? Why do we quit so early on? Why is it so difficult to tolerate the frustration we feel? We must remind ourselves that these feelings touch everyone. Sadness is a basic reality for all of us. We’re often harder on ourselves then we would be on a friend. So for starters, we should at least allow ourselves the same degree of forgiveness we wouldn’t hesitate to grant to an acquaintance. Circumstances we thought we could never get over gradually become bearable. We adjust our thinking and grow accustomed to our new reality. But most importantly, we should always remember that asking for help is courageous, never shameful. To get your new year started on a positive step, book a free consultation call with one of our Coaches. Despite wanting to spend time with family during the holidays, getting together can be difficult to arrange. Everyone has different schedules. Work, school, friends, and many other things seem to get in the way. However, winter break is a great opportunity for togetherness and bonding with family. It’s the end of December and what does that mean? Winter break is finally here! Some people will say this is the most wonderful time of the year. Winter brings not only snow, but also holiday magic, the joy of giving, and the happiness of sharing these moments with your family and friends. Also, schools are closed, and the kids are at home. Spending time with your child is a little bit easier now, right? But winter break lasts (only) a few days – from Christmas Eve until January. So we want you to get the most out of it! How did you spend Christmas this year? We hope you enjoyed it and made some unforgettable memories. However, New Year’s Eve is fast approaching. If you’re out of ideas on how to celebrate it, read our articles Creative Ideas for How to Spend Holidays With Your Family part 1 and part 2. How did you feel days (or weeks) before Christmas? Let’s admit it – we all get stressed out making plans for the holidays. We want everything to be perfect – which can mean that although holidays are usually joyful, they also bring a lot of tension. Family obligations and lots of have-to-dos can be overwhelming, so feeling out of control is not unusual. And, still, there’s so much more to do! Does this sound familiar? We should keep in mind that nothing can be perfect. The good thing about that is – it doesn’t have to be! Also, do you really have to do all those things the way you’ve planned ? You don’t! The key to memorable holidays is simply being together. New Year’s Eve is coming soon, so don’t make the same mistake again. Here’s a few tips on handling that holiday stress. Dealing with all this pressure is pretty hard. So we’ve listed seven ideas that are easy to implement and can help you spend memorable and, more importantly, stress-free holidays with your family. Everything’s easier if you do it together! Those things you “have to do” transform into family activities. Making cookies with your children is sure a big mess, but also so much fun! Probably those cookies won’t be the best you’ve ever eaten, but that’s okay because you made them together! The cookies we mentioned are a great example. Also, keep in mind that most families have less than perfect holidays – the meal didn’t turn out well, the cookies aren’t that pretty, family tension is high, etc. And if you have negative feelings, don’t deny them – there’s nothing unusual or wrong about feeling down at holiday time. Admitting and talking about them will surely help. Just try it. No devices – really listen to people. In today’s digitally-fueled world, it’s pretty hard not to answer calls, reply to text messages, or check what’s new on social media. Screen time often eats into family time. Still, we can’t not check our devices from time to time. How about making a rule that no devices are allowed during mealtime, for example? Here’s one more family activity – make gifts for people who are homeless or feeling lonely. If you have toy experts in your house (younger kids) you can let them pick some toys and donate them to Toys for Tots. This will teach your children about sharing and brighten someone’s holidays. Let everyone know how much you’ve appreciated their gift. Thank people who do things for you but whom you may have taken for granted. Show your family members how much they mean to you and how much you love them. Also, call a relative who lives far away and wish them happy holidays. Winter break is a break. Notice that you’re being hard on yourself. Even though you want to please your children and make everything the way they love, don’t forget about yourself. Treat everyone with kindness, including you! Take time out. Let yourself to sleep more, watch your favorite movie again, and generally do the things you love. We at Nobel Coaching & Tutoring wish you Happy Holidays! Health, happiness, and lots of love this Season and success in the New Year! Folbre, N. (2006). Family time: The social organization of care. London: Routledge. In this article, we’ve decided to tackle the topic of good and bad perfectionism. People tend to have very black-and-white views when it comes to this. They think perfectionism is either a great thing that helps us become better, or that it’s a horrible habit which may lead us into depression and anxiety. But as with most things in life, it’s not that simple. There’s the good kind and the bad kind, and we’ll help you learn how to tell them apart and strive for the good one. Let’s first start with a widely accepted definition of perfectionism. Perfectionism refers to the desire to achieve the highest standards of performance while being extremely critical about one’s performance. Therefore, if you’re a perfectionist, you’ll be setting unrealistically high goals for yourself. Chances are, you’ll also be judging your performance more critically than anyone else, which will lead you to become easily dissatisfied with your actions and achievements. So, in essence, you’re trying to reach something virtually impossible and getting angry at yourself when you make even the slightest mistake. What a paradox! From this definition, it’s clear that what we usually think of as perfectionism is, in fact, bad for our health and our happiness. Not only are you dissatisfied when you make a mistake (even if you’re the only one who sees it), but even when you are performing well, you’re constantly feeling stressed out. “I can’t make a mistake!” “What if I look silly in front of my co-workers?” “What if I mess this up?”. It’s a lose-lose situation. 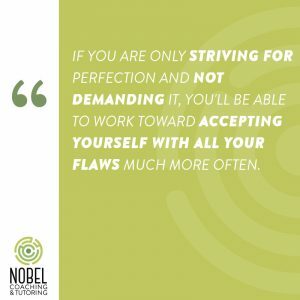 But if you are only striving for perfection and not demanding it, you’ll be able to work toward accepting yourself with all your flaws much more often. Moreover, you’ll stop seeing each mistake as a failure and accept it for what it is – a normal thing that can happen to anyone and is in no way the end of the world! It may be clear now that the main difference between bad and good perfectionism lies in self-acceptance. You can still have perfectionistic goals, but if you also want to be happier, have better relationships, and be far less stressed out, you’ll also need to develop the ability to accept yourself and your actions non-judgmentally. You can decide to work harder and do better next time, but you won’t be putting yourself down and feeling worthless, and that’s a huge difference. If you often find yourself feeling like this and it’s bringing you down, there are ways to change this behavior. Reach out to one of our Coaches and schedule a free 30-minute consultation, which can help you see the possibilities of overcoming the tendency. Another important thing to mention is that perfectionism toward oneself is not the only form of perfectionism. You can also be perfectionistic towards others, which is referred to as Other-Oriented Perfectionism. This can happen to parents, romantic partners, bosses… Instead of placing huge demands on yourself, you may be putting them on others. Other-Oriented Perfectionism can result in a child being overly concerned about making a mistake, and always be thinking they’re not good enough, no matter what they do. Or maybe you were this child. Maybe you had parents or teachers who always expected perfect results, or maybe you have a boss who does the same! This would be the kind of perfectionism called Socially Prescribed Perfectionism. You notice that others have set very high standards for you, and you’re doing your best to prove capable of reaching them, even if it is affecting your health and happiness. The good news is, you can still strive for more, and encourage your kids to do the same. The formula remains the same: show acceptance, both for yourself and for your children. Give your children time to accept that they’re not perfect before you suggest some things they might think about changing next time. Give them the chance to accept the defeat on their own terms, and help them by hugging them and telling them you are proud of the effort they put into it. Start by letting them know that you accept them – and then maybe take them out for some ice cream. That tends to help as well! The same thing goes for you. Set realistic goals for yourself and accept that, like every other human being on this planet, you’ll sometimes make mistakes and take more time to reach those goals than you were planning. It doesn’t make you any less good; if anything, it makes you more human. … Accepting yourself and others is an essential part of becoming (and raising) healthy, happy, and successful people. Take care of your health and happiness first – and reaching your goals will turn out to be far easier. Lundh, L. (2004). Perfectionism and Acceptance. Journal of Rational-Emotive & Cognitive-Behavior Therapy, Vol. 22, 4, pp.255-267. Black Friday has finally come! Although it’s not a national holiday, many people look forward to shopping then. Special offers, deals, and sales are everywhere and you can find a ton of advice on how/where/what to shop, and tips and tricks on how to be “the winner of the day”. But do you really need to buy something just because it’s Black Friday? Black Friday, falling on the day after the Thanksgiving holiday, is one of the busiest shopping days of the year. Originally, the term marked the day when a retailer had sold enough inventory and turned a profit for that year. So Black Friday refers to the day of the year when retailers hope to go from being in the “red” (i.e. losing money) to being in the “black” (i.e. making money). How does Black Friday look today? These days, since it’s one of the busiest shopping days of the year, Black Friday is known for long lines, packed stores, aggressive customers, and a limited number of products available at a reduced price. Retailers use discounts to draw consumers into their stores and will aggressively campaign by offering incentives like gift cards and other small enticements. Many of them will offer limited-quantity sales to bring customers through their doors . 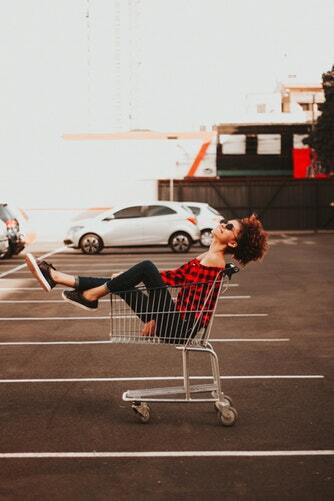 Whether people are searching in malls, department stores, specialty stores, or online, the sales on Black Friday are very effective at encouraging them to shop. Some people spend hours and even days preparing for Black Friday, scouring newspaper, internet, and television ads for the best Black Friday deals. Then groups and families strategically plan the best routes to their favorite stores, collect stacks of Black Friday ads and coupons, and coordinate strategies for purchasing products once inside the store [1, 5]. Why do people love to shop on Black Friday? Hundreds of consumers crowding in to grab marked-down goods create a sense of competition, which in turn creates hedonistic shopping value – enjoyment from the mere process of buying things. We love to share stories and show off our bargains at the end of the day, boasting about the great deals we found and how we managed to get hold of that last popular item. Paying a low price for something makes us feel smart and pleased with ourselves. We have a sense of accomplishment and perhaps the thrill of feeling in a small way victorious over other customers [1, 4]. The Black Friday experience can have a bonding effect . However, sometimes the limited availability of goods in stores can excite those who view this as a form of competition. If someone gets in their way when they’re trying to reach an item they want, they might feel frustrated, which can devolve into an aggressive response towards the person blocking their way [1, 2, 3]. This aggressiveness can be dangerous! Now, we have frustration and safety concerns on the one hand and pleasant emotions on the other, so what are we going to do? Before you answer this question, read about Buy Nothing Day – the anti-Black Friday movement that falls on the same day as Black Friday. The aim of this day is to inspire worldwide action against mass consumerism and rediscover how to live freely. It tries to show us that we need to take a harder look at the stuff we’re purchasing on Black Friday and decide whether we really need all of it. Also, it points out the irony of giving thanks for everything we already have one day and going out to buy more things (we don’t really need) the next one. Lots of people use social media to post about this movement, so explore a bit – you may find many enlightening facts. Trying to buy something that’s on sale but really isn’t discounted or is in limited quantity can be disappointing, for sure. However, these holiday sales can actually have an upside. Everyone is now expected to offer discounts as a goodwill gesture and not every retailer uses tricks to attract customers. You still can find things that you need or want and pay a better price for them. Just be discerning, purchase worthwhile items, and don’t get caught up in the consumerism! We know that the holidays can be tough and stressful for some people. 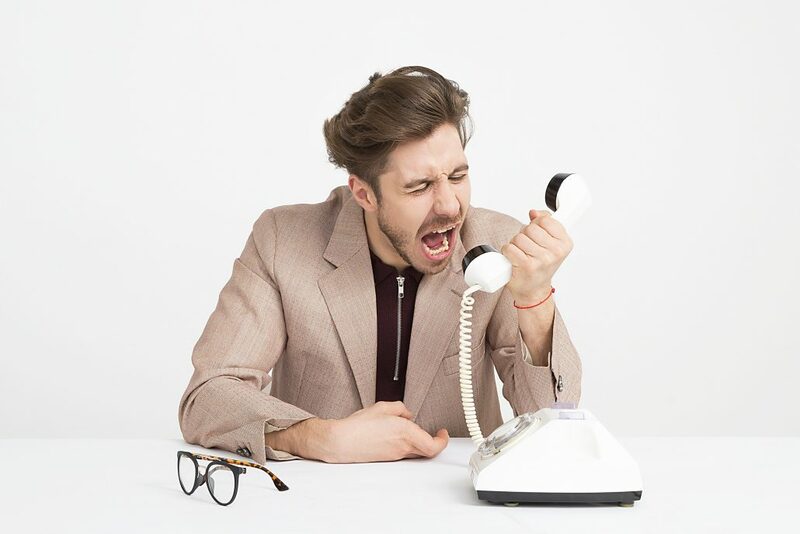 If you are experiencing “the holiday blues”, feeling stressed out or you simply need to talk to someone, don’t hesitate to book a free consultation call with one of our Coaches. They are always there for you! Berkowitz, L. (1989). Frustration-aggression hypothesis: Examination and reformation. Psychological Bulletin, 106, 59-73. Holbrook, M. B., Chestnut, R. W., Oliva, T. A., & Greenleaf, E. A. (1984). Play as a consumption experience: The roles of emotions, performance, and personality in the enjoyment of games. Journal of consumer research, 11(2), 728-739.